Welcome to lesson 7 ‘Service Desk’ of the ITIL Intermediate OSA Tutorial, which is a part of the ITIL Intermediate OSA Certification Course. This lesson focuses on Service Desk. It is one of the functions of the ITIL service lifecycle. Explain the complete end-to-end process flow for the service desk function inclusive of design strategy, components, activities, and operation, as well as any interfaces with other processes or lifecycle phases. Explain the service desk validation components and activities such as service desk role, organizational structures, challenges, and test components to ensure service quality within OSA. Let us learn about the benefits of Service Desk in the next section. What are you waiting for? Interested in taking up an ITIL Intermediate OSA Course? Check out our Course Preview! Let us talk about the objectives of service desk in the next section. The primary objective of service desk is to provide a single point of contact between the services being provided and the users and to restore the “normal service” to the users as quickly as possible. Moving on, let us look at the responsibilities of the service desk team. Updating the CMS under the direction and approval of service asset and configuration management if so agreed. The next section talks about the organizational structure that the service desk needs to establish. Let us learn about it in detail. 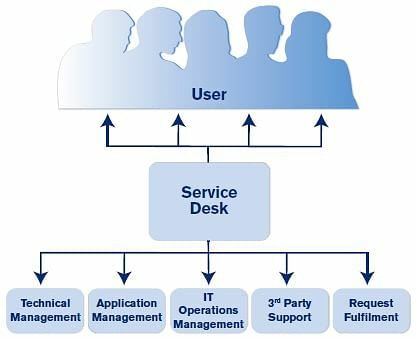 Following are the levels of service desk organizational structure. We will discuss them in detail in next few sections. There are many ways of structuring service desks and locating them – and the correct solution will vary for different organizations. The primary options are detailed in the next pages, but in reality, an organization may need to implement a structure that combines a number of these options in order to fully meet the business needs. Service Desk on a broader aspect can be of three types namely Local Service desk, Centralized Service desk and Virtual Service Desk. Let us first learn about Local Service Desk. 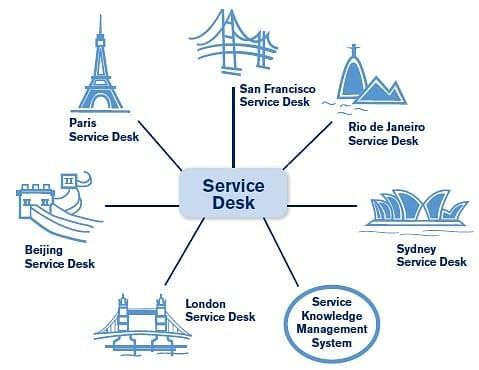 What is Local Service Desk? Local Service Desk is where a desk is co-located within or physically close to the user community it serves. This often aids communication and gives a clearly visible presence which some users like. However, there can be a downside to a Local Service Desk as it is can be inefficient and expensive to resource justify this. There may, however, be some valid reasons for maintaining a local desk, even where call volumes alone do not justify this. And reasons might include language and cultural or political differences, Different time zones, specialized groups of users, the existence of customized or specialized services that require specialist knowledge and VIP/criticality status of users. The next level is Centralized Service Desk. Let us see how different it is from the local service desk. When companies grow, they might consider a Centralized Service Desk (formed by one or more centralized desks). 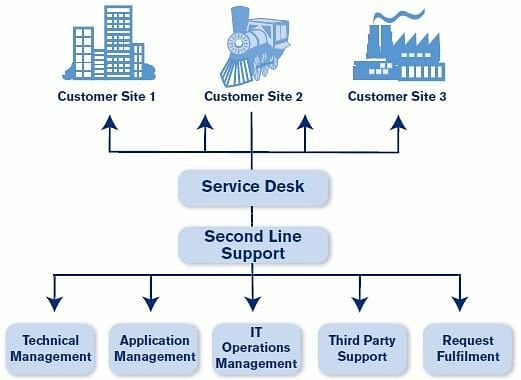 A Centralized Service Desk is constituted by merging Local Service Desk into a single location (or into a smaller number of locations), drawing the staff into one or more Centralized Service Desk structures, in this structure multiple user groups are served form one physical location. This can be more efficient and cost-effective, allowing fewer overall staff to deal with a higher volume of calls, and can also lead to higher skill levels through great familiarization through the more frequent occurrence of events. One of the disadvantages with Centralized Service Desk is the distance to users. To compensate for the distance a Centralized Service Desk often has a local presence to handle physical support, controlled and deployed from Centralized Service Desk. The third level is the Virtual Operation Desk. Let us see how different it is when compared to other two desks discussed so far. Larger organization with widespread location or many departments might consider a Virtual Service Desk. This gives an impression of a single, Centralized Service Desk, located in any number or type of geographical or structural locations. For all users, there is a single point of contact (e.g., phone number or e-mail address) and their calls can be handled by any of the locations. It is important that a single Service Knowledge Management System (SKMS) is used by all locations. Advantages for a virtual service desk would be its Cost effectiveness. One more concept which nowadays is a pretty common phenomenon is Follow-the-sun concept. Companies with a global presence can apply a “Follow-the-Sun” approach of the Virtual Service Desk. This combines two or more geographically disappeared service desk to provide 24-hour Service. For example, a service desk in Asia-Pacific may handle calls during normal business hours and then hand over any open Incidents to the European based desk at the end of this period. The European-based desk then handles these Incidents along with their own until their standard hours have finished. At this point, they hand over to the US-based desk who then hand back to the Asia-Pacific desk at the end of their standard hours. This allows 24-hour coverage at a relatively low cost. However, care needs to be taken along the same lines as the Virtual Service Desk in terms of common processes, tools, shared knowledge base, etc. Apart from these, there is also a structure known as Specialized Service Desk Groups. Let us learn about it in the next section. For some organizations it might be beneficial to create “specialist groups” within the overall Service Desk structure so that Incidents relating to a particular IT service can be routed directly to the specialist group. This can allow faster resolution of these Incidents, through greater familiarity and specialist training. Examples of how this can be achieved include through Interactive Voice Response (IVR), Automated Service Desk, Web-based only interface and Direct Routing. Next, we will be looking at what kind of environment should the service desk function. This is a very important factor that impacts the team members to work efficiently. A location where the entire function can be positioned should have sufficient natural light and overall space – to allow adequate desk and storage space, and room to move around if necessary. A quiet environment with adequate acoustic control so that one telephone conversation is not disrupted by another is also a basic criterion. Pleasant surrounding and comfortable furniture so as to lighten the mood. A separate restroom and refreshment area nearby so that staff can take short breaks as appropriate when necessary without being away for too long. Well this must enable them to work efficiently. Moving on, as the service desk is a huge department, one will be really in a fix not knowing whom to contact. Let’s find the answer for this in the next section. Preparing to become an expert in ITIL Intermediate OSA? 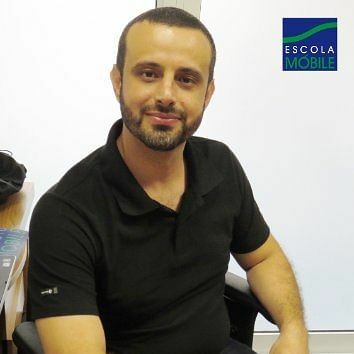 Why not enroll in our ITIL OSA Course! Who is the single point of contact in service desk? Regardless the combination of options chosen to fulfill an organization’s overall service desk structure, individual users should be in no doubt about whom to contact if they need assistance. A single telephone number should be provided and well-publicized – as well as a single email address and a single web service desk contact page. Placing the details on notice boards or physical locations that users are likely to regularly visit (entrances, restaurants, near the water dispenser, etc. ) are the most common ideas to promote service desk culture. In the next section, let us look at staffing of service desk. On what basis the staffing of service desk is done? Let us look at each one separately in the coming sections. An organization must ensure that the correct numbers of staff are available at any given time to match the demand being placed upon the desk by the business. Call rates can be very volatile and often on the same day the arrival rate may go from very high to very low and back again. Many organizations will find that call rates peak during the start of the office day and then fall off quickly, perhaps with another burst in the early part of the afternoon – this obviously varies depending upon the organization’s business but it is an often occurring pattern of many organizations. In such circumstances, it may be possible to utilize part-time staff, home-workers, second-line support staff or third parties to cover the peaks. Business requirements such as budget, call response time, etc. Size, relative age, design, and complexity of the IT infrastructure and Service Catalog – for example, the number and type of Incidents, the extent of customized versus standard off-the-shelf software deployed, etc. The number of customers and users to support, and associated factors such as Number of customers and users speaking a different language, Skill level and Incident and Service Request types (and types of RFC if appropriate). The volume and types of Incidents and Service Requests are also a major factor while determining the staffing levels. Next, we will learn about the skill levels required for staffing. Another factor to consider when deciding on the skills requirements for service desk staff is the level of customization or specialization of the supported services. Standardized services require less specific knowledge to provide quality customer support. The more specialized the service, the more likely specialist knowledge will be required on the first call. Once the required skill levels have been identified, there is an outgoing task to ensure that the Service Desk is operated in such a way that the necessary staff obtains and maintain the necessary skills. As we have seen that the skills of an individual become the deciding factor for service desk, similarly enhancing their skills also becomes a deciding factor for further positions in staffing for the service desk. In the next section, we will learn about how training enhances the skills. How does training help in improving the skills of a staff in service desk? It is important that all service desk staffs are appropriately trained before they are called upon to staff the Service Desk. A formal induction program should be undertaken by all new staff. Where possible, a business awareness program, including short temporary assignments into key business areas should be provided. When starting on the service desk, new staff should initially “shadow” experienced staff – sit with them and listen in on calls – before starting to take calls themselves with a mentor listening in and able to intervene and provide support where necessary. Mentors may need to be trained on how to mentor. Service Desk experience and technical skills are not the only requirements for mentoring. Effective knowledge transfer skills and the ability to teach without being condescending or threatening are equally important. While it is important to develop their core competencies in their current role, having a clear career path and recognizing future requirement and development needs is also important. Well, once the training is complete and the staff is onboard executing the skills and eventually retaining them for a long time also becomes important for the service desk. Let us see how retention can be applied in case a staff decides to leave. How does retention work for Service desk? It is imperative that all IT managers recognize the importance of the service desk and the staff who work on it! Any significant loss of staff can be disruptive and lead to inconsistency of service – so efforts should be made to make the service desk an attractive place to work. The Service Desk can often be used as a stepping stone into other more technical or supervisory/managerial roles. If this is done, care is needed to ensure that proper succession planning takes place so that the desk does not lose all of its key expertise in any area at one time. Who are these Super Users? How do they function? Many organizations find it useful to appoint or designate a number of “Super Users” throughout the user community, to act as liaison points with IT in general and service desk in particular. Super User can be given some additional training and awareness and used as a conduit for communications flow in both directions. They can help prevent Incident backlogs when a key service or component fails, affecting many users. It is important to note that Super Users should log all calls that deal with, and not just those that they pass on to IT. It may also be possible for Super Users to be involved in Staff training for users in their areas, providing support for minor Incident or simple Request Fulfillment and Involvement with newly released and rollouts. Next, we will look at the metrics of service desk to track its performance. Metrics for Service Desk performance must be realistic and carefully chosen. It is common to select those metrics that are easily available and that may seem to be a possible indication of performance; however, this can be misleading. An increase in the number of calls to the service desk can indicate less reliable service over that period of time – but may also indicate increased user confidence in a service desk that is maturing, resulting in a higher like the hood that users will seek assistance rather than try to cope alone. Further analysis and more detailed metrics are, therefore, needed and must be examined over a period of time. Only measuring internal performance will not be enough to gauge how well the service desk functions. It is equivalently important to measure how well its users/customers are satisfied. Let us learn the different ways of measuring customer satisfaction in the next section. As well as tracking the “hard” measures of the Service Desk’s performance, it is also important to look at “soft” measures. These measures include how well the customers and users feel their calls have been answered, whether they feel the Service Desk operator was courteous and professional, and whether they installed confidence in the user. This type of measure is best obtained from the users themselves. This can be done as part of a wider customer (or) user satisfaction survey covering all of IT or can be specifically targeted as service desk issues alone. One effective way of achieving the letter is through a callback telephone survey, where an independent service desk operator or supervisor calls back a small percentage of users shortly after their Incident has been resolved, to ask the specific questions needed. Care should be taken to keep the number of questions to a minimum (five to six at the most) so that the users will have the time to cooperate. The service desk must act on low satisfaction levels and any feedback received. The customer feedback becomes even more important in the case where service desk is outsourced. Yes, the service desk can also be outsourced. Let us learn about this in the next section. The decision to outsource is a strategic issue for senior managers – and is addressed in detail in the Service Strategy and Service Design publications. Regardless of the reasons for (or the extent of) the outsourcing contract, it is vital that the organization retains responsibility for the activities and services provided by Service Desk. The organization is ultimately responsible for the outcomes of the decision and must, therefore, determine what service the outsourcer provides, not the other way round. If the outsourcing route is chosen, there are some safeguards that are needed to ensure that the outsourced Service Desk works effectively and efficiently with the organization’s other IT teams and departments. Care should also be taken that end-to-end Service Management control is maintained (this is particularly important for organizations seeking ISO/IEC20000 certification as overall management control has to be demonstrated). Some of these safeguards are set out below. Are the tools used and processes followed by the outsourced team same as the internal service desk? Let us look at the answer in the next section. What are tools and processes followed by outsourced Service desk? If the Service Desk is outsourced, care must be taken that the tools are consistent with those still being used in the customer organization. Often there are severe integration problems between the new tool and the legacy tools and processes. For this reason, it is important to ensure that these issues are properly researched and customer’s requirements are adequately scoped and specified before the outsourcing contract. Ideally, the outsourced desk should use the same tools and processes to allow smooth process flow between the service desk and second- and third-line support groups. In addition, the outsourced service desk should have access to all Incident Records and information, Problem Records and Information, Know Error data, Change schedule, SKMS, CMS, and Alerts from monitoring tools. In the next section let us learn about the outsourcing SLA targets. 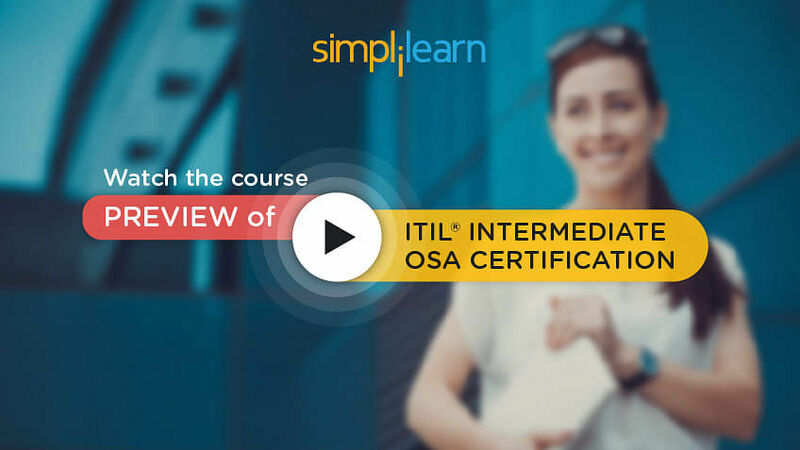 Looking to learn more about ITIL Intermediate OSA? Why not enroll in our Course now! What are the outsourcing SLA targets? The SLA targets for overall incident-handling and resolution time needs to be agreed with the customers and between all teams and departments – and OLA (or) UC targets need to be coordinated and agreed with individual support groups so that they underpin and support the SLA targets. As we know that targets are very essential to measure any process, similarly good communication process is also very important. Let us learn about good communication in service desk. The line of communication between the outsourced Service Desk and the other support groups need to work very effectively. For the same you should have Close physical co-location, Regular liaison (or) review meetings and Cross-training tutorials between the teams and departments. Partnership arrangements can also be done when staffs from both organizations are used jointly to staff the desk To have a clear communication plans and performance targets are documented in a consistent manner in OLAs and UCs. In the case where the Service Desk is located offshore, not all of these measures will be possible. However, the need for training and communication of the Service Desk staff is still critical, even more so in cases where there are language and cultural differences. Let us look at outsourcing ownership of data in the next section. Clear ownership of the data collected by the outsourced service desk must be established. Ownership of all data relative to users, customers, affected CIs, services, Incidents, Service Requests, changes, etc. must remain with the organization that is outsourcing the activity – but both organizations will require access to it. Data that is related specifically to the performance of employees of the outsourcing company will remain the property of that company, which is often legally prevented from sharing the data with the customer organization. This may also be true of other data that is used purely for the internal management of the service desk, such as headcount, optimization activities, service desk cost information, etc. All reporting requirements and issues around ownership of data must be specified in underpinning contract with the company providing the outsourcing service. We have come to the end of this module, let us summarize in the next section. Next, we will focus on the other functions. We already know that there are 4 functions in ITIL lifecycle. We have covered Service desk and we will learn about CSI OSA Functions and Roles in the next lesson. "Very good. Have a good knowledge on trainer topics. Excellent interpersonal skills." "The training was very good"
"Trainer & course material are very good. Well organized"